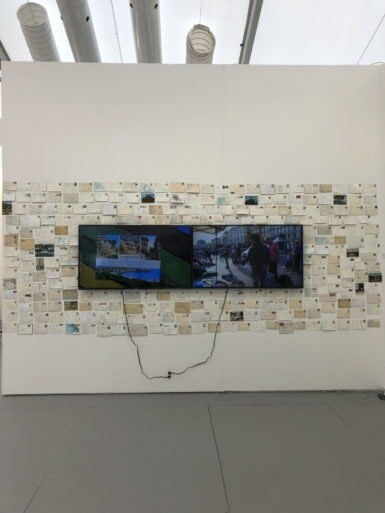 4 December 2018 This afternoon, at the VIP opening of Untitled art fair in Miami, London’s Edel Assanti gallery had a somewhat unusual offering: Yoshinori Niwa’s multimedia installation Resending postcards sent during the Cold War to the intended recipients (2017). Niwa, a Japanese artist based in Vienna, collected over 100 postcards that he found at various locations around the Austrian capital. Each of the postcards Niwa included in his installation date from around the time of the Cold War and went undelivered. A smattering of them is hung on a wall, along with two television screens. One monitor shows Niwa collecting the postcards from thrift stores, garbage dumps, and novelty shops; the other depicts him at the post office mailing them. Yoshinori Niwa, Resending postcards sent during the Cold War to the intended recipients (2017).